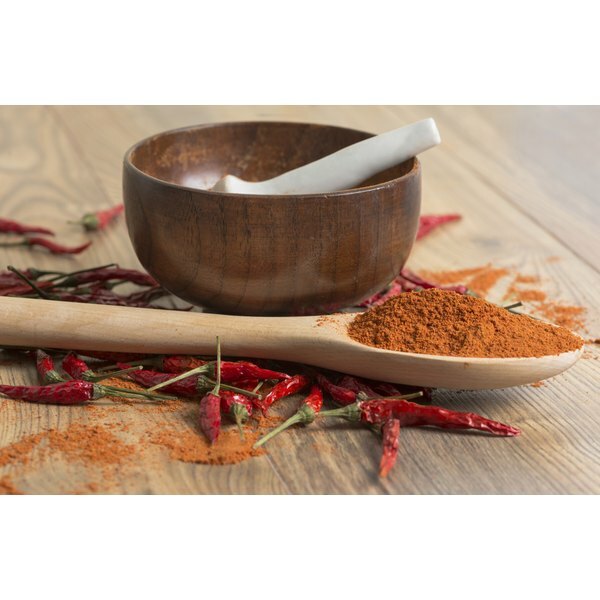 Cayenne pepper may soothe a sore throat, providing pain relief for a temporary period. There is no proven science to define why cayenne pepper relieves a sore throat. However, in theory, the oils within cayenne pepper block substance P, which is a peptide that transmits pain signals to your brain. A sore throat is scratchiness, pain and irritation that is often agitated by the act of swallowing. The most common cause of sore throats is the common cold or a viral infection. If you have a sore throat, you can temporarily alleviate the pain by inhibiting bacterial growth and calming the inflamed tissue. Both store bought and home remedies can provide temporary relief. If a sore throat persists or worsens after three days of home treatment, you should consult with your physician. If you use cayenne pepper to remedy pain, you might save yourself the time and money required to purchase a commercial remedy. Aside from time and money, a cayenne pepper gargle is claimed by some to be more effective than commercial sore throat medications. Additionally, cayenne pepper often provides instant pain relief that lasts for up to two hours. There is no proven evidence that cayenne pepper consistently works as a sore throat remedy. It does not treat the bacterial infection that causes the ailment, and therefore, it truly cures nothing. Additionally, the heat of cayenne pepper can cause more discomfort on your tongue and lips than the pain from the sore throat. You can make a cayenne pepper gargle to alleviate sore throat pain with only a mug, 1/4 cup of hot water and 2 tbsp. of cayenne pepper. Stir the cayenne pepper into the water for 60 seconds and gargle with a mouthful of the mixture. Gargle for 10 seconds and spit the cayenne mixture out. Stir the cayenne pepper mixture before gargling with more as it does not fully dissolve into the water. Adding 1 tbsp. of salt to the mixture may increase its effectiveness as salt inhibits bacterial growth, further calming a sore throat.